Zanaboni's procedure for establishing Saint-Venant's principle is ex- tended to anisotropic homogeneous transient heat conduction on regions that are successively embedded in each other to become indefinitely elon- gated. No further geometrical restrictions are imposed. The boundary of each region is maintained at zero temperature apart from the common surface of intersection which is heated to the same temperature assumed to be of bounded time variation. Heat sources are absent. Subject to these conditions, the thermal energy, supposed bounded in each region, becomes vanishingly small in those parts of the regions suficiently remote from the heated common surface. As with the original treatment, the proof involves certain monotone bounded sequences, and does not depend upon differential inequalities or the maximum principle. A definition is presented of an elongated region. Knops, R., Quintanilla, R. Spatial decay in transient heat conduction for general elongated regions. 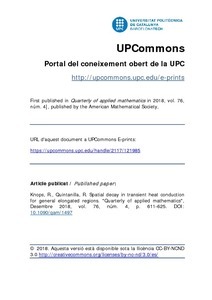 "Quarterly of applied mathematics", Desembre 2018, vol. 76, núm. 4, p. 611-625.